HOPE – A proposal to restructure the Hope Public School District’s energy usage and bring the savings back to the district was heard by the HPS Board here Monday night. 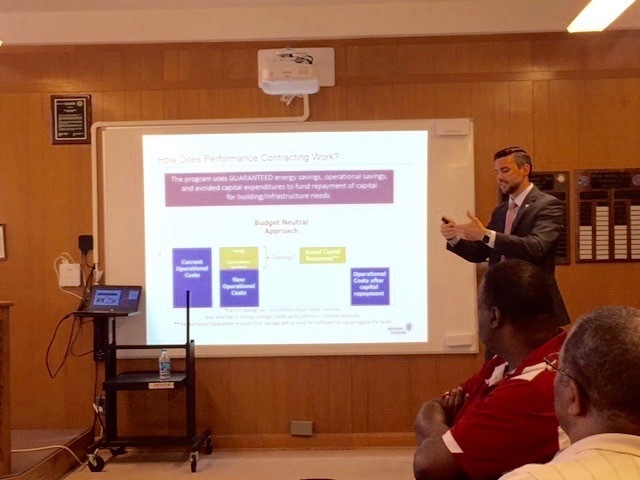 The board voted unanimously to table action on the proposal by Johnson Controls, of Little Rock, to take time to determine how the idea fits into the master facilities plan for the district. HPS Superintendent Bobby Hart recommended that the board consider the proposal, which is designed to use engineering-based study of the district’s energy needs versus its uses and find savings. Alex Ray, Johnson Controls representative, told the board that the “performance contract” is a concept which has been recognized in Arkansas law as a means of procuring infrastructure without capital expenditures. “The project completely pays for itself; it is redirecting funding within your budget,” Ray said. He said the concept is intended to produce guaranteed savings or the company will pay for any target shortfall. “The performance guarantee assumes that, at a minimum, it will be enough to fund the capital improvements,” Ray said. That means the district will not need any tax-based financing. Ray said initial study by Johnson Controls indicates a potential savings of some $2 million through conversion districtwide to LED lighting, replacement of HVAC units, and occupancy control of buildings. But, trustees Denny Dickinson and David Powers wanted to know how the Johnson proposal was any different from simple, efficient maintenance on the district’s part. Ray said the initial study by the company on a campus by campus basis allowed it to isolate specific areas of emphasis that can be resolved now to produce immediate savings in maintenance and replacement costs. He said the company typically conducts an “investment grade audit” of the district’s energy costs and uses upon which it recommends specific changes and, then, acts as the general contractor for implementation. Ray said the company is a Fortune 500 enterprise which has been in business for 132 years and has performed 3,100 successful similar contracts since 1983 for the City of Little Rock, the University of Arkansas, the University of Arkansas for Medical Sciences and the Little Rock Public Schools, among others. He said the company will produce engineering plans and specifications, as well as construction drawings for its recommendations, which will become the property of the district, whether the HPS proceeds beyond the audit stage or not. Financing is arranged through the company, Ray said; and, is not tax-based, but is intended to be interim to the project’s eventual savings. “This is not capital debt; these are not bonds,” he said. But, both Dickinson and Powers were concerned about the district’s ability to control the project, particularly in the bid stages. Ray said that authority would remain with the district to choose its actual contractors for work performed. Hart said he brought the proposal to the board because of future needs. The board voted to revisit the idea at its July meeting. Also Monday, the board reviewed and acted upon a number of personnel policy recommendations by both the district’s personnel policy committee and the Arkansas School Boards Association. --Unify school bus driver salary schedules to maintain staffing while eliminating long-route and short-route distinctions, and provide for uniform salary increases. --Modify a distinction in the “attendance incentive” between classified and certified personnel to provide a $25 per day incentive for classified personnel on a study basis over a year. --Reject a proposal concerning overtime/compensating time relative to paid, duty-free break time for classified employees. --Reject a proposed classified employee death benefit policy. --Accept ASBA classified personnel policy recommendations. --Accept upgrade of summer school pay rate. --Approved a recommendation for the replacement of three bus engines at a cost of $54,797.75 by Artex Truck Center, Inc., in Texarkana. --Approved the resurfacing of the playing floor at Jones Field House by Gentry and Holder Floors, Inc., of Frierson, La., at a cost of $19,000. --Approved the bid of Missco, Inc., for furnishings to Hope Academy of Public Service technology center. --Agreed to study the possibility of contracting transportation operations and services.